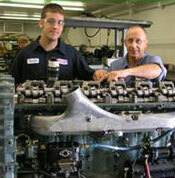 A dependable and reliable Service Support is crucial, and we are well prepared to assure excellent Product Support. Global Reserves LLC is proud of its main product line and the features and benefits that make up its attractiveness to this ever-growing market. The main features and benefits of its core products to its customers include that Global Reserves LLC utilizes proprietary technology to convert gas to electricity. 1. Accept and convert gas into electricity at 60 Hz and at a power quality and voltage acceptable to the utility company acquiring the electricity. 2. 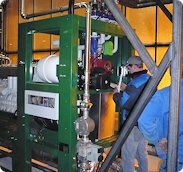 Capable of operating on gas with a heating value ranging between 700 and 1250 Btu/scf. 3. Capable of operating on gas pressures ranging from 10 psig to 700 psig. 4. Net energy conversion heat rate shall be no more than 12,800 Btu/kw-hr. HHV basis. 5. Capable of long life between major maintenance intervals. 6. Does not require a dedicated water source. 8. Starting, interconnecting with Buyer and loading and fully automatic operations. 9. Continually monitors all key operational variables. 10. Constructed to meet National Fire Prevention Association Standard 85. 11. Provided with all electrical safety sensors to meet the Utility safety requirements and also protect the system from utility generated faults. 12. Equipped with a computer interface screen for easy system monitoring by the operator. 13. Meets local noise ordinances. 14. Meets all local, State, and Federal air pollution regulations. 15. Meets local, State, and Federal water pollution regulations. 16. Shop packaged for minimal field assembly. 17. All equipment containerized for attractive appearance. 18. Capable of remote monitoring. 19. Needs no hazardous chemicals and does not generate hazardous wastes. 20. Used oil and fluids will be collected and recycled by local vendors. 21. Operation is not encumbered by adverse weather conditions. 22. Relies on time tested, proven technologies. 23. Equipped with an emergency shutdown system. 1. Accessible Terminal Box, including Terminal Block for easy Voltage Reconnection. Digital AVR (Automatic Voltage Regulator). 2. Elastic Engine - Generator Coupling, axial ductile, Torsion elastic with high Damping Capacity. 3. 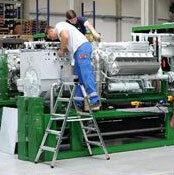 Oversized Heavy Duty Double Bearing Generator for optimized Efficiencies and extended Operating Life. 4. Zero Pressure Regulator along Gas Train Main Pipe between by-directional Deflagration Flame Arrestor, and Gas Mixer. 6. Gas Train Pipe from Deflagration Flame Arrestor to Zero Pressure Regulator. 7. Oscillation Decoupling Devices designed to surpass the Performance Level of conventional Elastomer Type Vibration Isolators. Integrated Spill Tray to catch any Lube Oil or Liquids. 8. Solid Body & Frame Structure, digitally 3-D designed, and manufactured with PLC controlled Laser Cut Precision, primed and electrostatic Polyester Powder painted, and Torsion Resistant with highest structural Integrity. 9. Side Panels all around, lockable (easy to remove). 10. Lower Deck Section containing Exhaust Heat Recovery System and Gas Train Components. 11. Exhaust Heat Exchanger including Thermal Insulation. 12. Electrical Sub Distribution Panel, to be connected to the controls and switchgear panels. 13. Thermal Heat Distribution & Pump Section, incl. Plate Heat Exchanger, Expansion Vessel, integrated Oil Tank, and Electrical Sub Distribution Panel. 14. All pre-flanged Water Circulation Connections are directed upwards, for easy Piping and Integration. Proprietary and patented Combustion Chamber Geometry, with unique Features leading to more efficient Combustion, more effective Energy Conversion, and extended Life. 15. Electronically controlled Ignition System with Bus Coupler to the Master Control. Early detection of Vibration and abnormal Conditions caused by Spark Plug Wear or Ignition Coil Failure. 16. Gas Flow Optimization and improved Throttle Position & Technology for more effective aerogenic Fuel Admission. 17. Proprietary Patented Air/Gas Ratio Mixer, especially designed for most efficient Performance. Fully integrated into the CHP Air/Fuel Ratio Control System. 18. Unique patented Turbo Charger System and Positioning with optimized Exhaust Path. 19. Motor-driven 3-Way Mixer to regulate the Return Circuit Temperature (to raise the Temp.). 20. Electrical Circulating Pump for the Heating Circuit. 21. Electrical Circulating Pump for the Engine. 22. Motor-driven 3-Way Mixer to regulate the Fuel/Air Mixture Cooling Circulation. 23. Gas Inlet with Safety Valve and Shut-Off Valve. 24. Gas Train with Fine Particle Filter, Manometer, Zero Pressure Regulator, and Gas Meter. 25. Double Magnet Valve, Electronic Gas Leak Detection, Gas Pressure Regulator, Gas Vacuum Sensor, digitally Microprocessor controlled, especially made for NG. 26. Gas Train Main Pipe to by-directional Deflagration Flame Arrestor, and Zero Pressure Regulator. 27. Exhaust Gas Heat Exchanger Exit. The Stainless Steel HE is especially designed for high efficient Heat Transfer. 28. Pressurization & Expansion Vessel for the Cooling Circuit to absorb Excess Water Pressure caused by Thermal Expansion. 29. Transfer Plate Heat Exchanger, advanced and highly efficient, self-cleaning, made of Acid-resistant Stainless Steel, with extreme high Heat Transmission. 30. Electrical Circulating Pump for the Heating Circuit. 31. Motor-driven 3-Way Mixer to regulate the Dump/Emergency Cooling Circulation. 32. All Piping and Plumbing for outgoing & incoming Water Flow included.